The fungus enters wounds, grows in and under the bark, and eventually kills the cambium all the way around the trunk, branch or twig. Sunken cankers form and the bark may crack. 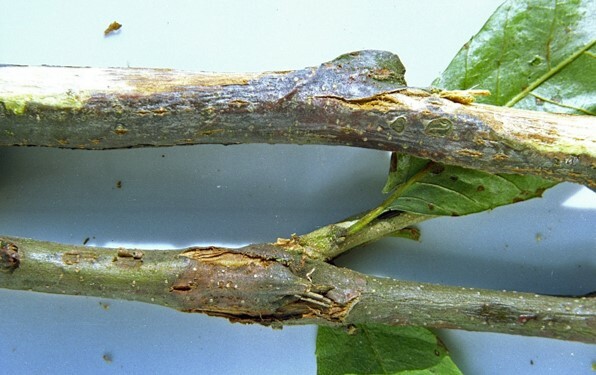 There may be trunk and branch swelling and resin exudate. A canker may expand around the circumference of the trunk or branch resulting in wilting and eventual death of the tree or branch above the canker. Orange fruiting bodies (stroma) of the fungus are produced on canker margins. Conidiomata and later ascoma (perithecia) form in the stroma producing conidia and ascospores. Ascospores are ejected and spread widely in air currents; conidia are dispersed locally by rain splash, or by any object that comes in contact (clothes, machinery and equipment). Can be spread in prunings, cuttings or dead wood. Plants with wounds, especially those made by insects. Note – This is pest was detected in Victoria and was under eradication for a number of years. It has not been detected since 2016. Trees with suspicious symptoms should be reported to your local biosecurity organisation. An initiative of the Nursery Levy funded National Nursery Industry Biosecurity Program (NY15004) and ‘Building the resilience and on-farm biosecurity capacity of the Australian production nursery industry’ Project (NY15002).